See also: Time-se­ries data for in­come & hap­piness? At first ap­prox­i­ma­tion, there are two mo­ti­va­tions for donat­ing money – ego­is­tic & al­tru­is­tic. The ego­is­tic mo­ti­va­tion for donat­ing is highly scope in­sen­si­tive – giv­ing away $500 feels roughly as good as giv­ing away $50,000. I haven’t found any aca­demic ev­i­dence on this, but it’s been ro­bustly true in my ex­pe­rience. This scope in­sen­si­tivity seems pretty baked in – know­ing about it doesn’t make it go away. I can re­mind my­self that I’m hav­ing 100x the im­pact when I donate $50,000 than when I donate $500, but I find that when I re­flect ca­su­ally about my dona­tions, I feel about as satis­fied at my small dona­tions as I do about my large ones, even af­ter re­peat­edly re­mind­ing my­self about the 100x differ­en­tial. We’re prob­a­bly also scope in­sen­si­tive qual­i­ta­tively – giv­ing $5,000 to a low-im­pact char­ity feels about as good as giv­ing $5,000 to an effec­tive char­ity (es­pe­cially if you don’t re­flect very much about the im­pact of the dona­tion, and es­pe­cially es­pe­cially if the low-im­pact char­ity tells you a com­pel­ling story about the par­tic­u­lar peo­ple your dona­tion is helping). EA some­times ad­vo­cates that giv­ing will in­crease your hap­piness. Here’s an 80,000 Hours ar­ti­cle (a) to that effect. Here’s a piece by Giv­ing What We Can (a). I think some­times im­plicit here is the claim that giv­ing effec­tively will in­crease your hap­piness (I think this be­cause al­most all other dis­cus­sion of giv­ing in EA spaces is about effec­tive giv­ing, and why effec­tive giv­ing is some­thing to get ex­cited about). It seems pretty clear that donat­ing some money to char­ity will in­crease your hap­piness. It’s less clear that donat­ing to an effec­tive char­ity will make you hap­pier than donat­ing to a low-im­pact char­ity. Given the scope in­sen­si­tivity of the ego­is­tic mo­ti­va­tion, it’s also un­clear that giv­ing away a lot of money will make you hap­pier than giv­ing away a small amount of money. It seems es­pe­cially un­clear that the dona­tion-to-hap­piness link scales any­where lin­early. Per­haps donat­ing $1,000 makes you hap­pier than donat­ing $100, but does it make you 10x as happy? Does donat­ing $2,000 make you 2x as donat­ing $1,000? My in­tu­ition is that it doesn’t. Okay, so that’s a bunch of dis­cus­sion from in­tu­ition & lived ex­pe­rience. Now let’s look at pa­per. Jebb et al. 2018 an­a­lyzed Gal­lup Wor­ld­wide Poll sur­vey data on in­come & hap­piness. This dataset had re­sponses from about 1.7 mil­lion peo­ple in 164 coun­tries, so we don’t have to worry about small sam­ple size. Jebb et al. were cu­ri­ous about the in­come sa­ti­a­tion effect – is there a point at which ad­di­tional in­come no longer con­tributes to sub­jec­tive well-be­ing? And if there is, where is it? Globally, hap­piness stopped in­creas­ing alongside in­come af­ter $95,000 USD /​ year. For Western Euro­pean re­spon­dents, hap­piness stopped in­creas­ing alongside in­come af­ter $100,000 USD /​ year. For North Amer­i­can re­spon­dents, the sa­ti­a­tion point was $105,000 USD /​ year. Emo­tional well-be­ing (some­times called he­do­nic well-be­ing or ex­pe­rienced hap­piness) refers to the emo­tional qual­ity of an in­di­vi­d­ual’s ev­ery­day ex­pe­rience – the fre­quency and in­ten­sity of ex­pe­riences of joy, fas­ci­na­tion, anx­iety, sad­ness, anger, and af­fec­tion that make one’s life pleas­ant or un­pleas­ant. Life eval­u­a­tion refers to a per­son’s thoughts about his or her life. Sur­veys of sub­jec­tive well-be­ing have tra­di­tion­ally em­pha­sized life eval­u­a­tion. The most com­monly asked ques­tion in these sur­veys is the life satis­fac­tion ques­tion: “How satis­fied are you with your life as a whole these days?” … Emo­tional well-be­ing is as­sessed by ques­tions about the pres­ence of var­i­ous emo­tions in the ex­pe­rience of yes­ter­day (e.g., en­joy­ment, hap­piness, anger, sad­ness, stress, worry). Jebb et al. break down emo­tional well-be­ing fur­ther into pos­i­tive af­fect & nega­tive af­fect, which roughly cor­re­spond to ex­pe­rienc­ing pos­i­tive & nega­tive emo­tive states. Life eval­u­a­tion seems like the more in­tu­itive met­ric for our pur­poses here. (It’s also the more con­ser­va­tive choice due to its higher sa­ti­a­tion points.) So when I talk about “hap­piness,” I’m ac­tu­ally talk­ing about “sub­jec­tive well-be­ing as as­sessed by life eval­u­a­tion scores.” My main points would still hold if we fo­cused on emo­tional well-be­ing in­stead. The in­come sa­ti­a­tion point for most EAs is at least $100,000 USD /​ year. Most EAs are in North Amer­ica and Western Europe. 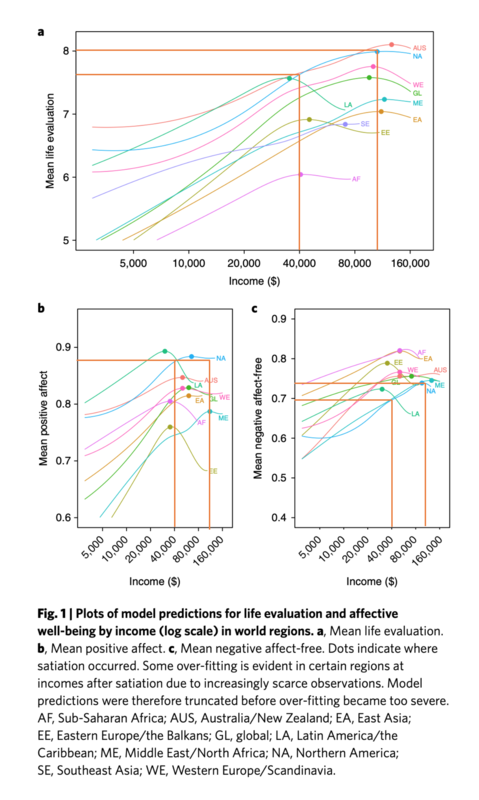 The sa­ti­a­tion point for life eval­u­a­tion in Western Europe is about $100,000 USD /​ year. The life eval­u­a­tion sa­ti­a­tion point in North Amer­ica is about $105,000 USD /​ year. Al­most all EAs fall into Jebb et al.’s “high ed­u­ca­tion” bracket: 16+ years of ed­u­ca­tion, i.e. on track to com­plete a Bach­e­lor’s. The “high ed­u­ca­tion” sa­ti­a­tion point is $115,000 USD /​ year. That’s a global figure. The pa­per doesn’t give a re­gion-by-re­gion break­out of the “high ed­u­ca­tion” co­hort; it’s likely that the figure is even higher in the Western Europe & North Amer­i­can re­gions, which have higher sa­ti­a­tion points than the global av­er­age. Essen­tially, all in­come earned up to $115,000 USD /​ year (for col­lege-ed­u­cated folks liv­ing in North Amer­ica & Western Europe) con­tributes to one’s hap­piness. Cor­re­spond­ingly, donat­ing amounts such that your an­nual in­come re­mains above $115k prob­a­bly won’t af­fect your hap­piness. There’s a wrin­kle here: it’s pos­si­ble that much of the hap­piness benefit of earn­ing a high in­come comes from the knowl­edge that you earn a high in­come, not what you use the money for ma­te­ri­ally. If this is the case, donat­ing large amounts out of an in­come above $115k shouldn’t ding your hap­piness. So per­haps only a weaker ver­sion of the claim holds: once you achieve an an­nual in­come above $115,000, you can give away large por­tions of it with­out in­cur­ring a hap­piness penalty (hav­ing already re­al­ized the happy-mak­ing benefit of your earn­ings). But even in this case, donat­ing large amounts out of an in­come less than $115k still low­ers your hap­piness (be­cause you never benefit from the knowl­edge that you earn at least $115k). It’s true that the act of donat­ing will gen­er­ate some per­sonal hap­piness. But given the scope in­sen­si­tivity at play here, you can re­al­ize a lot of this benefit by donat­ing small amounts (and thus keep­ing a lot more of your money, which can then be de­ployed in other happy-mak­ing ways). From a purely ego­is­tic view­point, scope in­sen­si­tivity lets us have our cake & eat it too – we can feel good about our donat­ing be­hav­ior while keep­ing most of our money. My pro­vi­sional con­clu­sion here is that EA shouldn’t recom­mend effec­tive giv­ing on ego­is­tic grounds. There re­mains a strong al­tru­is­tic case to be made for effec­tive giv­ing, but I think it’s worth ac­knowl­edg­ing the real trade­off be­tween giv­ing away large amounts of money and one’s per­sonal hap­piness, at least for peo­ple earn­ing less than $115,000 USD /​ year (on av­er­age, for col­lege-ed­u­cated peo­ple in Western Europe & North Amer­ica). If you want to give large amounts while avoid­ing this trade­off, you should achieve a sta­ble an­nual in­come of at least $115k be­fore mak­ing sub­stan­tial dona­tions. Fur­ther, EA should ac­tively dis­cour­age peo­ple from effec­tive giv­ing if they’re mainly con­sid­er­ing it as a way to be­come hap­pier. Effec­tive giv­ing prob­a­bly won’t make you hap­pier than low-im­pact giv­ing, and donat­ing large amounts won’t make you hap­pier than donat­ing small amounts. Say­ing oth­er­wise would be a false promise. Thanks to Gre­gory Lewis, Howie Lem­pel, He­len Toner, Ben­jamin Pence, and an anony­mous col­lab­o­ra­tor for feed­back on drafts of this es­say. Cross-posted to my blog. I’ve only ever seen the claim that donat­ing some can be bet­ter for one’s own welfare, com­pared to a baseline of not giv­ing at all—not that the EA ap­proach to giv­ing is ac­tu­ally the op­ti­mal for hap­piness (!). Clar­ified my view some­what in this com­ment. See also this com­ment. Thanks for this; I ac­cord with al­most all of what you’re say­ing. Re: the com­mu­nity benefits of EA, these mostly seem to ac­crue via ac­tive par­ti­ci­pa­tion in EA spaces (the Fo­rum, face­book groups, work­ing with EA orgs, at­tend­ing mee­tups & con­fer­ences), rather than by mak­ing large dona­tions. Thanks, I ed­ited that part of the piece to get more ac­cu­rate about 80k’s view & the thing I’m point­ing to. More on what I’m point­ing to in this com­ment. Upvoted for bring­ing in a lot of cool re­search! Didn’t strong-up­vote be­cause I felt the con­clu­sion was a lit­tle too strong (“ac­tively dis­cour­age”, es­pe­cially), and I wish you’d linked to some ex­am­ples of EA pro­mot­ing ego­is­tic giv­ing. 1. I sense a re­ally fan­tas­tic op­por­tu­nity here to trick Buz­zfeed into donat­ing a lot of money: “$10 char­i­ta­ble dona­tion vs. $1000 char­i­ta­ble dona­tion”. 2. Is there a par­tic­u­lar case of EA com­mu­ni­ca­tion that you think ac­tively goes against the sci­ence you cite? I vaguely re­mem­ber see­ing writ­ing in a few places along the lines of “giv­ing can make you hap­pier” or “giv­ing effec­tively can make you more con­fi­dent” (and by im­pli­ca­tion, hap­pier), but not “giv­ing more can make you hap­pier”. 3. It would be good to see one of these stud­ies speci­fi­cally take on EA-style giv­ing, where peo­ple of­ten have an un­usu­ally strong sense of what their money is buy­ing and can feel un­usu­ally con­fi­dent that it will ac­tu­ally help. Most char­i­ties don’t have any­thing nearly as im­mer­sive as GiveDirectly Live, a web­site which (to me) makes ev­ery ad­di­tional dol­lar I give pretty darn salient. 4. “Ac­tively dis­cour­ag­ing” peo­ple who want to use effec­tive giv­ing to be­come hap­pier seems far too strong. For one, the stud­ies you cite gen­er­ally look at large num­bers of peo­ple; even if giv­ing doesn’t make the av­er­age per­son hap­pier, it still seems like it could make any given in­di­vi­d­ual hap­pier. If we want to give max­i­mally ac­cu­rate in­for­ma­tion, we could say “there are a lot of differ­ent things that might work, giv­ing is one, sav­ing your money might be bet­ter”, but our abil­ity to ad­vise in­di­vi­d­u­als seems re­ally con­text-de­pen­dent. I’ve known peo­ple who I thought would ac­tu­ally be a lot hap­pier upon donat­ing more; I’ve known other peo­ple for whom “get fi­nan­cially se­cure so you can have FYM ASAP” was bet­ter ego­cen­tric ad­vice. Be­com­ing more al­tru­is­tic in spirit/​per­son­al­ity seems to be pretty helpful for a lot of peo­ple. I don’t know how much the sci­ence backs that up, so I wouldn’t recom­mend it as an offi­cial re­sponse, but “car­ing about other peo­ple makes you happy” does seem like one of the strongest cross-cul­tural “com­mon sense” les­sons in all of hu­man ex­pe­rience. I think Jebb et al. 2018 gives ev­i­dence that sav­ing your money would be bet­ter than mak­ing greater-than-nom­i­nal dona­tions, at least un­til you achieve fi­nan­cial in­de­pen­dence. Re: 4 & 5 – it’s kind of an edge case, be­cause I think ev­ery­one is mo­ti­vated by both ego­is­tic & al­tru­is­tic drives to some de­gree. I don’t know of any ev­i­dence that donat­ing effec­tively makes some­one hap­pier than just donat­ing. I agree that the link is prob­a­bly heav­ily sub­lin­ear. But I won­der if it be­comes less sub­lin­ear if one is more con­scious of im­pact-per-dol­lar. I’ve had this ex­pe­rience my­self, sort of, in that I be­gan to en­joy giv­ing more af­ter I found EA and my pre­vi­ous “well, I hope this works” feel­ing re­solved into “yes, I found the best deal on helping!“. And since I know that I’ve found a good deal with high-EV re­turns, giv­ing more does feel bet­ter, just as it would if I were de­posit­ing more money into a high-yield in­vest­ment. Mean­while, be­cause I have enough money to be ma­te­ri­ally com­fortable, the idea of “$1000 in sav­ings lets me skip work­ing for an­other two weeks in 40 years, as­sum­ing I even want to stop work­ing” doesn’t hold much ap­peal, com­pared to “spend­ing $1000 on one of the world’s best prod­ucts”. I think there are many other use-cases for sav­ings than just re­tiring ear­lier (e.g. Jeff & Ju­lia’s mer­cury catas­tro­phe, which cost $50,000 to clean up). This is cer­tainly true! Money can buy al­most any­thing, in­clud­ing se­cu­rity against fu­ture dis­asters. I’m only mak­ing a per­sonal claim about my­self and my own use of money. I per­son­ally of­ten feel like giv­ing is the form of spend­ing that will make me “hap­piest”, be­cause it feels like a di­rect path to me get­ting a sense of per­sonal satis­fac­tion in a way that sav­ing of­ten doesn’t. Peo­ple are more likely to give when cer­tain mark­ers of “effec­tive­ness” are satis­fied (e.g. you tell them ex­actly how the money will be spent, you tell them the char­ity is rel­a­tively low-over­head, you tell them how much progress you’ve made to­ward solv­ing a prob­lem). “More likely to give” =/​= “more happy af­ter giv­ing”, but it does seem to rep­re­sent some­thing like “an­ti­ci­pates be­ing hap­pier af­ter giv­ing” (that’s a rea­son­able in­ter­pre­ta­tion for why peo­ple do al­most any­thing with money). Th­ese claims come from what I re­mem­ber about writ­ing a the­sis on giv­ing be­hav­ior. The rele­vant ma­te­rial starts on p. 59, items (1), (4), and (6), though I’m syn­the­siz­ing a broader base of ev­i­dence here (plus a bit of in­tu­ition from my ex­pe­riences talk­ing about EA with peo­ple out­side the com­mu­nity). EA some­times ad­vo­cates that giv­ing effec­tively will in­crease your hap­piness. Here’s an 80,000 Hours ar­ti­cle (a) to that effect. Here’s a piece by Giv­ing What We Can (a). Nei­ther of your ex­am­ples backs up your point. Giv­ing 10% of your in­come to effec­tive char­i­ties can make an in­cred­ible differ­ence to some of the most de­prived peo­ple in the world. But what effect will giv­ing have on you? You may be con­cerned that it will dam­age your qual­ity of life and make you less happy. This is a perfectly rea­son­able con­cern, and there is no shame in want­ing to live a full and happy life. As I noted in prior dis­cus­sion, not only do these sources not claim ‘giv­ing effec­tively will in­crease your hap­piness’, I’m not aware of this be­ing claimed by any ma­jor EA source. Thus the ob­jec­tion “This line of ar­gu­ment con­fuses the effect of donat­ing at all with the effect of donat­ing effec­tively” tar­gets a straw man. From my cur­rent un­der­stand­ing, ex­tra in­come will con­tinue to af­fect hap­piness quite a bit up to at least $115,000 /​ year (on av­er­age for col­lege-ed­u­cated peo­ple in Western Europe and North Amer­ica, in terms of sub­jec­tive eval­u­a­tion of one’s life qual­ity). And achiev­ing an in­come of $115,000 /​ year is much harder than achiev­ing one of $40,000 /​ year. I no­tice I have some difficulty think­ing through the im­pli­ca­tions of a 0.5 bump in life satis­fac­tion on a 0.0 to 10.0 scale, es­pe­cially when the 0.5 in­crease is in ag­gre­gate across an en­tire life­time. On an­other view, the 0.5 bump is quite a lot. If 10.0 on the scale is “most satis­fy­ing life pos­si­ble”, go­ing from 7.5 to 8.0 could be a big frickin’ deal. Also could be a big deal if the 0.5 bump cashes out to some­thing like “one less ter­rible day per month, for the rest of your life”. This con­sid­er­a­tion is prob­a­bly dom­i­nated by mea­sure­ment prob­lems though. When I sub­jec­tively as­sess my life satis­fac­tion, I have trou­ble dis­cern­ing the differ­ence be­tween a 7 and an 8 on a 0-10 scale (though I’m bench­mark­ing on 10 be­ing “best out of the ways my life has tended to go”, not “most satis­fy­ing life pos­si­ble”). I’ve started us­ing a 0-5 scale be­cause of this gran­u­lar­ity con­sid­er­a­tion. It’s much eas­ier for me to tell apart the differ­ence be­tween 3 and 4 on a 0-5 scale than it is to tell apart 7 and 8 on a 0-10 scale. “After a cer­tain point, mak­ing more money has se­vere diminish­ing re­turns re: your hap­piness, as does donat­ing lots of money. There’s a temp­ta­tion to use “donate a lot of money to effec­tive causes” to scratch the “sense of pur­pose” itch, which I don’t think works very well (due to the diminish­ing re­turns). Giv­ing effec­tively will be good, both for you and the peo­ple you’re helping. I think this corol­lary is of­ten con­veyed im­plic­itly, but feels real re­gard­less. Giv­ing effec­tively will be about as good for you as other types of giv­ing, but giv­ing effec­tively can be more de­mand­ing than other types of giv­ing. So there’s of­ten a trade­off be­tween your per­sonal hap­piness & effec­tive giv­ing, es­pe­cially if you’re giv­ing large amounts out of an in­come less than $115,000. It’s quite pos­si­ble that EA lead­ers already agree with this amended corol­lary, in which case all I’m ad­vo­cat­ing for is be­ing clear about the hap­piness<>giv­ing trade­off. I don’t think life eval­u­a­tion is the right mea­sure­ment of hap­piness for this though. I’m pretty ego­tis­ti­cal and more in­come would definitely make me hap­pier, well be­yond the thresh­old here. I make about 100k/​year and would definitely be more satis­fied with my life if I made 200k. But, that’s purely from a “feel­ing like a suc­cess”/​so­cial sta­tus stand­point. I have no re­al­is­tic lifestyle use for 200k. I can’t even figure out how to use 100k on lifestyle be­cause the things peo­ple typ­i­cally buy are re­ally bor­ing. So even though mak­ing more money would make me hap­pier, spend­ing more of it on my­self wouldn’t. Pos­i­tive af­fect is bet­ter but may still be af­fected too much by life eval­u­a­tion. So nega­tive af­fect is prob­a­bly the best mea­sure, since it’s more re­lated to the pos­si­bil­ity of suffer­ing due to in­suffi­cient money. I think you’re ap­proach­ing an in­ter­est­ing point on the earn­ings curve. Prob­a­bly mak­ing $200k and giv­ing away $100k would be more satis­fy­ing than earn­ing $100k and giv­ing away $1,000 (wildly spec­u­lat­ing here). I’m not sure that mak­ing $100k and giv­ing away $50k of it would be more satis­fy­ing than earn­ing $50k and giv­ing away $1,000 though. After re­flect­ing on it for a minute, I think it prob­a­bly would be, but nowhere near 50x. And you’d be leav­ing a lot of other happy-mak­ing pos­si­bil­ities on the table if you gave away $50k out of $100k (which seems less true for giv­ing away $100k out of $200k).